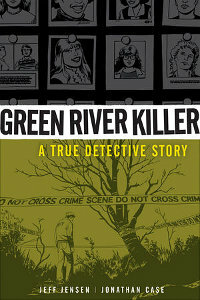 Green River Killer: A True Detective Story by Jeff Jensen and Jonathan Case. Release date: September 28, 2011, pre-order now! I got an advance copy via NetGalley. My interest in this is fairly obvious. I grew up in the area where the Green River Killer stalked, and I heard about the killer during times of my life when it hit pretty hard. When they announced his capture, I posted an entry in my blog about it that summed up my feelings. It was unreal. It would always be unreal. For me, the Green River Killer was a bogeyman that haunted the background of my world. And his capture never seemed to satisfy the need I had for closure. So I went into this book hoping it would wash away some of that childhood terror for me. This book mostly follows Tom Jensen, the father of the writer and a member of the Green River Killer Task Force. Tom's life is sketched out in jumps through time, and then we get to the capture of the Killer and his plea bargain deal. My biggest issue with the book was the scattered nature of the timeline. The whole thing was flashback after flashback. It could have worked, but for some reason it managed to confused me more than once. The worst problem is how the prologue starts with the Killer, then the first chapter jumps to Tom. For a page or two I thought we were reading about the Killer's early life. That made Tom a disturbing character from the outset, something I really don't think the writer was going for. That was pretty much my only complaint though. The jumps through time made this a hard book to follow in places but the information and feeling in it... well, that was important. Particularly the emotion. We get to see Tom as a man who has worked hard to bring this killer to justice, and we get to see him finally face off against the murderer and ask him the questions that we all wanted to ask. We see him break down, like any sane person would, when finally confronted with what the killer truly was. And we see his exhaustion and sense of relief when his part in the whole thing was finally over. Did this book exorcise the nightmares? Perhaps. I see the killer more as a very sick man than a supernatural being of terror. I see how regular people reacted to him, and struggled to find and stop him. For the record, I have no problem with the killer spending his life behind bars instead of dying. Dying is easy, and a much kinder fate than he deserves. Let him live to be 100 with no hope of release.